The pursuit of birds in view appeals to lots of people for lots of reasons. Beyond the activity's obvious natural allure, "chasing" birds keeps watchers physically fit. Learning and identifying hundreds of species on the fly challenges the intellect and intensifies awareness. And for photographers and illustrators, there is no better subject. 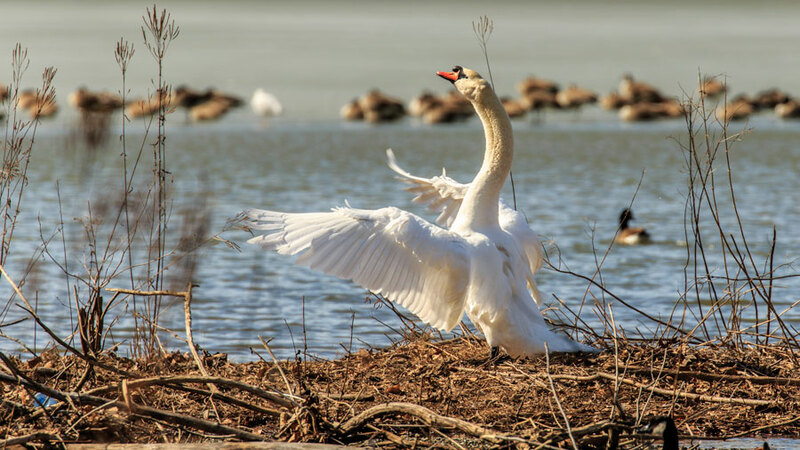 The concentration of ridges, valleys and wetlands in our area holds a fortune of interaction with the avian experience any time of year, but especially in spring. The spring thaw brings back all those species that migrated to warmer climates in the fall. Waterfowl, including green-winged and blue-winged teal, ring-necked and wood ducks, and pied-billed grebes are some of the early birds to show up as the ponds thaw. 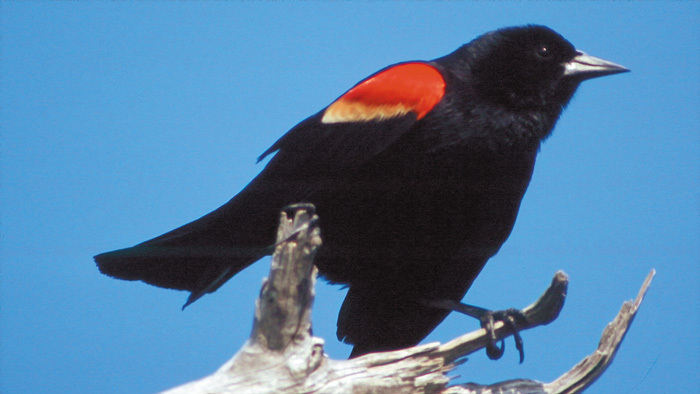 Positive signs of spring include the first red-winged blackbirds that start staking out territories during late February and eastern phoebes that sometimes come back even before their insect dinners come out. Eastern bluebirds also become more obvious in early spring. From late April through May our diversity of habitat brings dozens of types of warblers and vireos, scarlet tanagers, northern orioles, indigo buntings, thrushes and brown thrashers into our forests. Watchers identify birds by any number of different strategies. Size is probably most obvious and quickly differentiates an osprey from a wren. Silhouette and posture can also easily distinguish the crown of a cardinal, the stoutness of a crow, or the alert stance of a robin. Some birds walk, some hop, and others waddle. From a distance an expert birder can tell what bird approaches by its flight pattern or beat of the wing while it still appears a black speck in the sky to most of us. Scientific classification (taxonomy) of birds is ever changing as new clues to evolutionary lineage constantly appear. Taxonomically birds are a class of life (Aves) subdivided into orders, then families, genus, and finally species. Some orders have many more families and species than others. 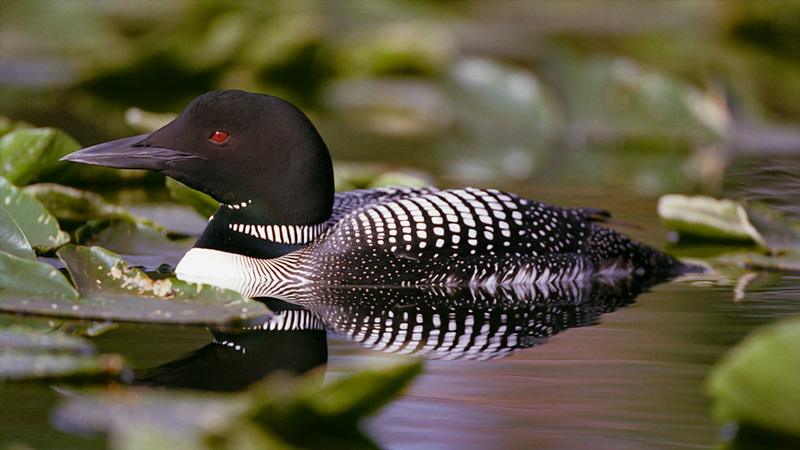 The common loon, for example, is the only member of its order, gavilforme. Owls have their own order, as do woodpeckers and waterfowl. Perhaps the most readily identifiable "cousins" within an order are the diurnal raptors ­ vultures, osprey, falcon, hawks and eagles. Passeriforme is the largest order of birds and contains over 5,000, more than half, of all avian species. Passerines are generally small, and most of them perch. Many are songbirds, having evolved complex muscles to control their sound-producing organ called a syrinx, different from our vocal chords. The more you listen, the more you hear passerine calls in all their incredible beauty and complexity. Families within the passeriforme order include flycatchers, chickadees, thrushes, warblers, sparrows, finches, larks, swallows, jays, crows, and starlings. Within those families are hundreds of species that make up most of what we see and hear in our woods and fields. A robin, for example, is a thrush, and a kingbird is a flycatcher. There are innumerable manuals to help you on your way to avian expertise, the standard bearers being the Peterson Field Guides. On the web, the Cornell Lab of Ornithology All About Birds is enormously helpful for beginners. Finally, New Jersey Audubon serves as an outstanding resource on the internet, through their publications and a year round schedule of talks, demonstrations and guided birding trips. 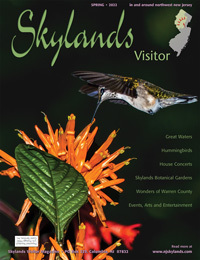 Headquarters are located at the Scherman-Hoffman Wildlife Sanctuary in Bernardsville (908/766-5787). Statewide and nationally, Audubon sponsors the annual World Series of Birding in mid spring, in which you are heartily invited to participate. We have presented here a small sampling of the birds available for viewing in Northwest New Jersey. Most are passerines along with a few woodpeckers, owls and water birds. We have left the largest (raptors) and smallest (hummingbirds) for another day. Photographs and short descriptions have been contributed by three constant companions of our publication: Donna Traylor, Bob Koppenhaver and Dan Bacon. Take a look, take a walk and awaken your senses. Robins winter in New Jersey, so the red-winged blackbird is really the first sign of spring. The flash of red in its wings and the gruff call from the phragmites signals that spring is here. The chickadee is quite common, and sometimes so tame it will feed from your hand. 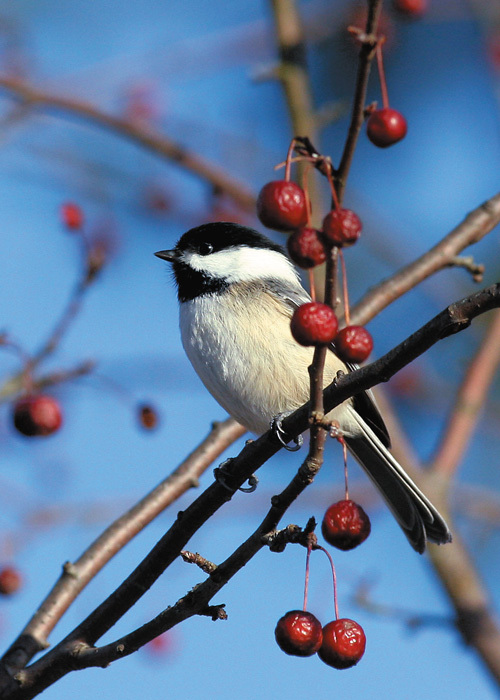 The chickadee's vocalization is one of the most complex in nature. 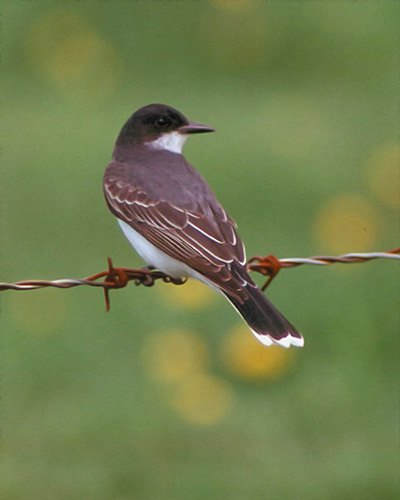 The eastern kingbird, a familiar member of the flycatcher family, looks as though it's tail was dipped in white paint. Look for it perching at field edges on barbed wire or tree snags. It will zip up, catch an insect, and then drop back to it's same perch. The tiny palm warbler is usually the first in its family to venture back to the north woods. Look for a flash of yellow and a bobbing tail. The yellow-rump warbler does not migrate south during the winter as the other warblers do. 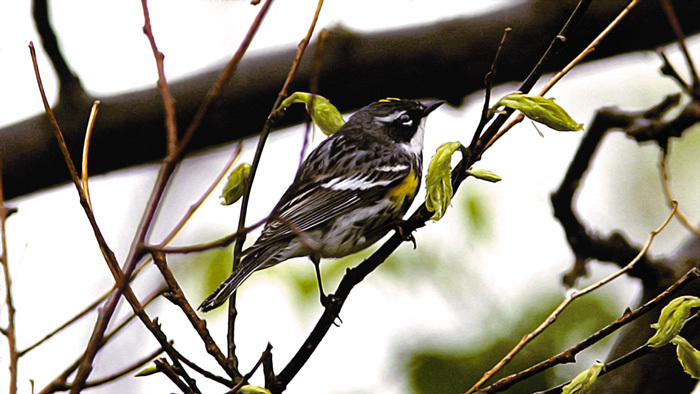 Because it is able to digest the waxes of bayberries and myrtles, the yellow-rump can use the waxy berries for food in the winter, allowing it to remain farther north than the other warblers. 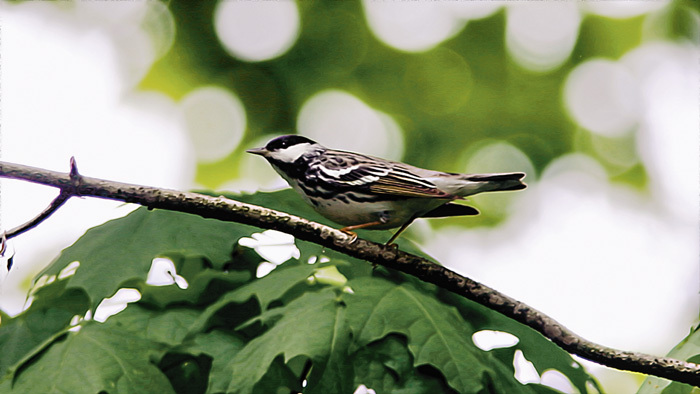 The blackpoll warbler can often be seen high up in a tree, scrambling rapidly after insects or spiders. If an insect tries to escape by flying off, the blackpoll will quickly dart after it, snatching it in mid-air flight. The blackpoll's tsit-tsit-tsit-tsit song is one of the highest pitched of all birds. The bell-like quality of the thrush's song is one of the most beautiful, lilting songs of nature. 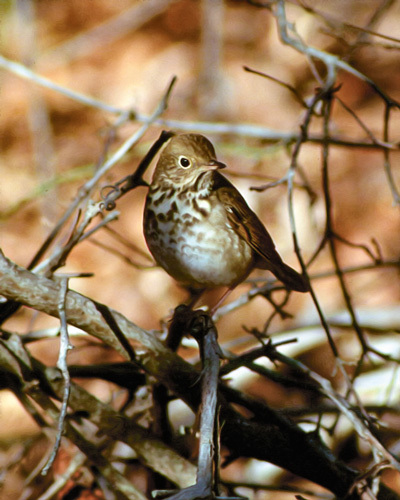 Listen at dusk and early in the morning for hermit thrush singing deep in the forests. 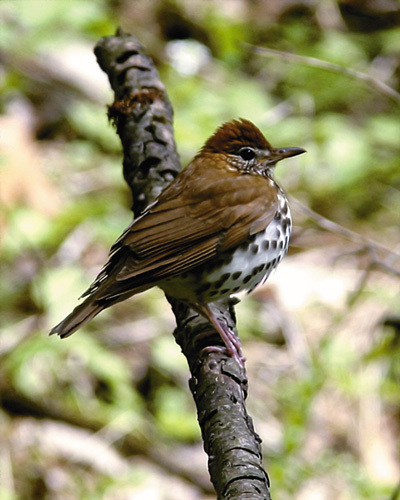 The wood thrush (right), identified by its rusty coloration and its black-dotted chest, abdomen and flanks, likes to flick aside leaf litter on the forest floor, hoping to uncover some juicy bug or worm for its next meal. Identifying sparrows ranges from easy to very difficult, depending on the type of sparrow, the time of year, and whether it is an adult or juvenile. Some sparrows are easy to identify because they are distinctly different from the rest, yet other sparrows are difficult to identify because they display confusing arrays of similar patterns and markings. 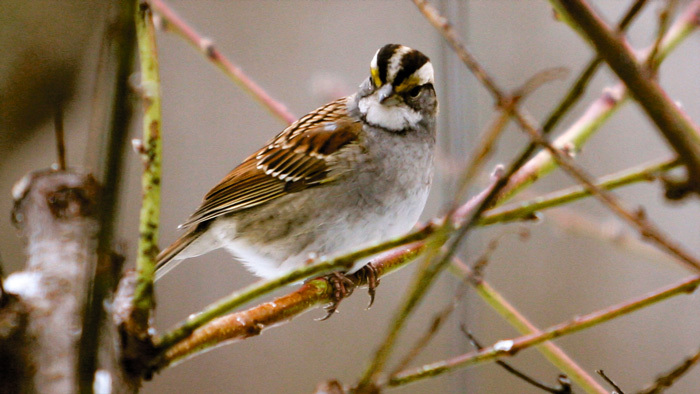 The whitethroated sparrow is often identified by its song mnemonic "old sam peabody". As summer progresses it becomes scarce locally as it makes its way north to breed. 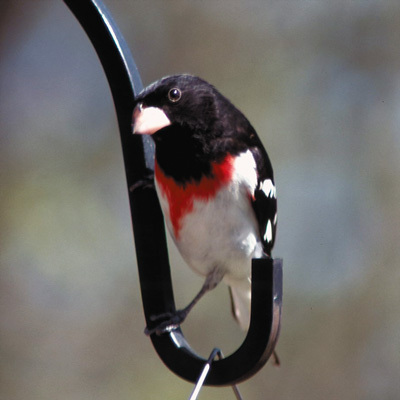 The male rose breasted grosbeak is a real head turner. The combination of red, black and white is hard to miss as it flies through wooded areas and edge habitats. 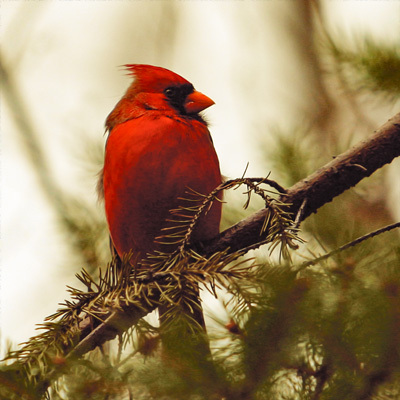 Closely related to the grosbeak, the male northern cardinal is unmistakable. A rich diet of holly bush berries is responsible for the bird's brilliant color. 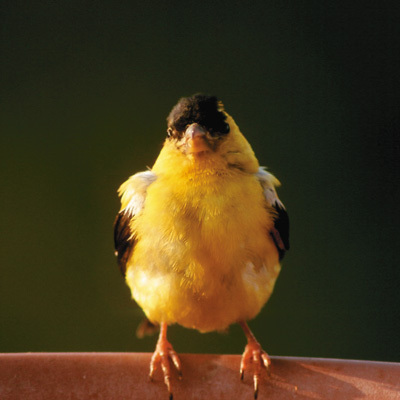 Once they're in their breeding finery, the American goldfinch becomes the NJ state bird we all know. Although they spend the year with us, many people don't recognize them in their winter drabs. 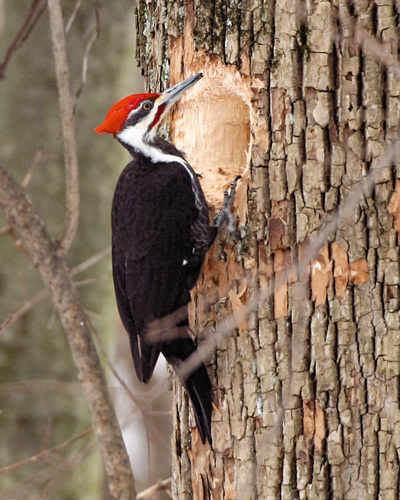 Its laughing call immortalized in Walter Lanz cartoons, the sight of pileated woodpecker is always exciting. 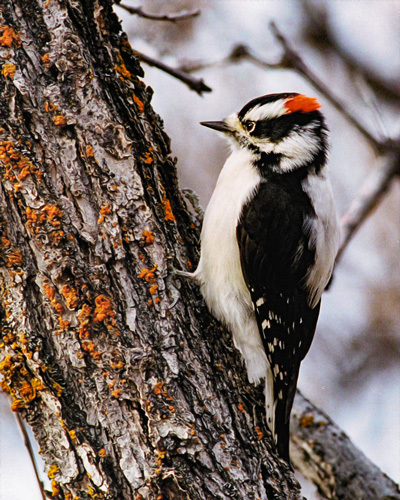 The less famous downy woodpecker is the smallest in North America. This great horned owlet (left) will be active and curious when Spring rolls around. 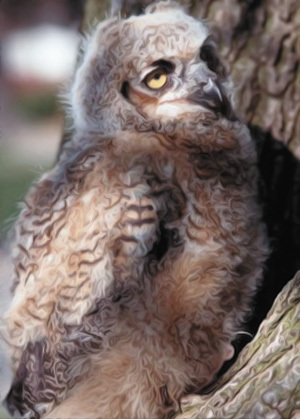 Great horned owls are one of the earliest nesting birds in NJ ­ look for them sitting on nests as early as January . 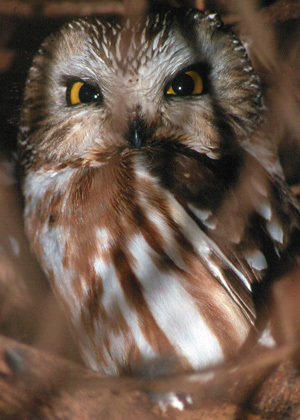 They are one of two species of "hoot owls" in NJ ­ the barred owl being the second. The saw whet is a small owl with no ears. 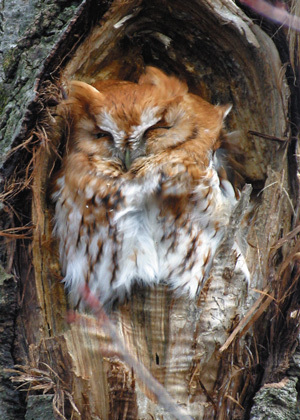 Screech owls are found in most habitats and are common in urban as well as rural areas. 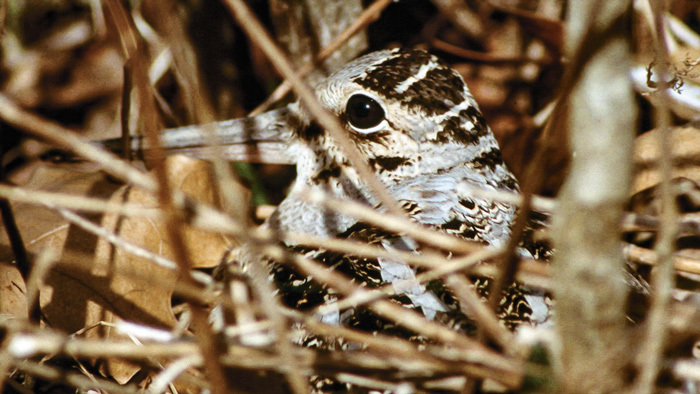 Listen for the distinctive "peent" calls of the woodcock in swampy areas at dusk. They spiral upward and then plummet back to within feet of where they took off. Silent in winter, a loon's spring call is eerie, from the age of dinosaurs. 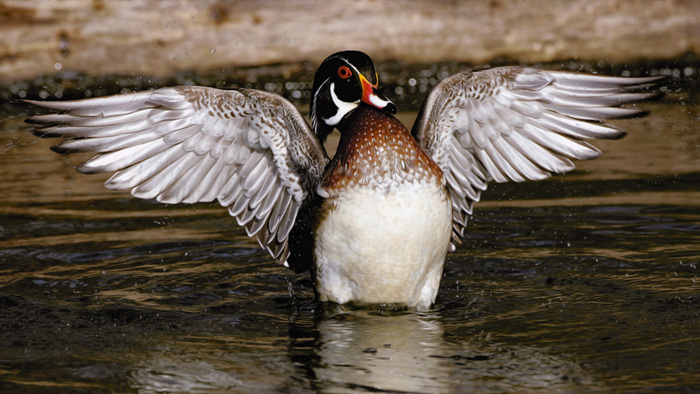 The flamboyant wood duck is one of only a few ducks that nest in trees, sometimes more than a mile from water.